The BEST food and caterer I have ever worked with! I can always depend on Our Kitchen To Yours to make delicious food at a great price with fantastic customer service! I feel my catering is a reflection of me and my reliability. Reliability and on time delivery are paramount to me. That is why I use Our Kitchen to Yours. 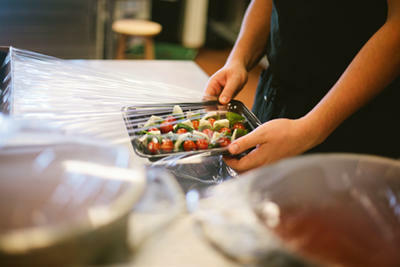 We use "Our Kitchen to Yours" weekly because of their fresh, healthy and delicious food. Donna is exceptional to work with and their customer service is superb. Donna has created many special occasion luncheons for us and they were better than we could have imagined. We needed a Caterer for our Daughters Wedding, and wanted to use someone local. That is when we discovered "Our Kitchen to Yours". From the very beginning Donna was such a professional, and really "listened" to our wants and needs. Donna and her staff provided us with such a Delicious Menu and such Superb Service. We love "Our Kitchen to Yours" so much that my Husband and I used them again for our Wedding Renewal!! !